Fresh Meadows in Queens looking south-east capturing the location of the Western Terminus of the Motor Parkway. What is the approximate year of the Mystery Foto? Who is the source of the aerial and why was it likely taken? 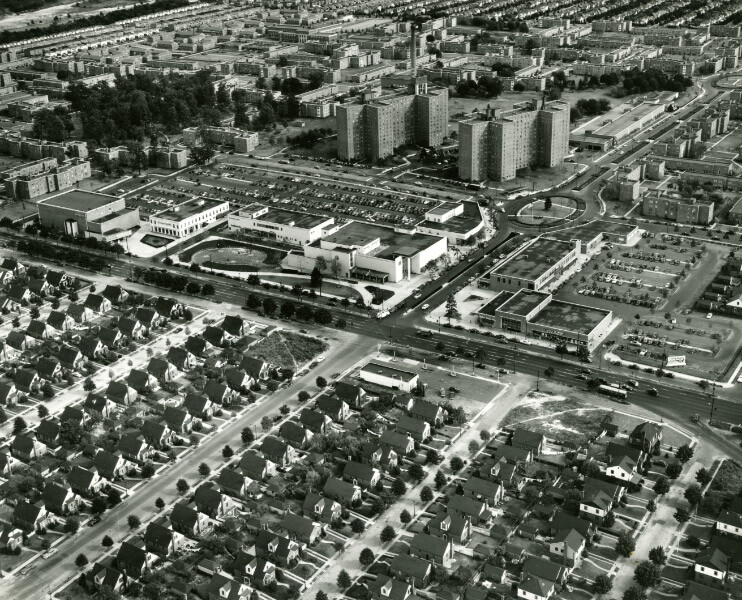 Thomas Airviews photographed the aerial to document the Fresh Meadows apartment complex owned by New York Life Insurance. This aerial and the below images are courtesy of the New York Life Archives. These images were obtained from the New York Archives in 2009 as suggested by Mitch Kaftan. Congrats to Greg O., Joe Oesterle, Art Kleiner (See Kleiner's Korner), Marc Alssid, Gene Perry, Sam Berliner III, Eric Shaffer, Roy Warner, Steven Swirsky, Brian McCarthy, Steve Lucas, Frank Femenias, David Stephan, and Frank Mendyk for identifying the Fresh Meadows location. 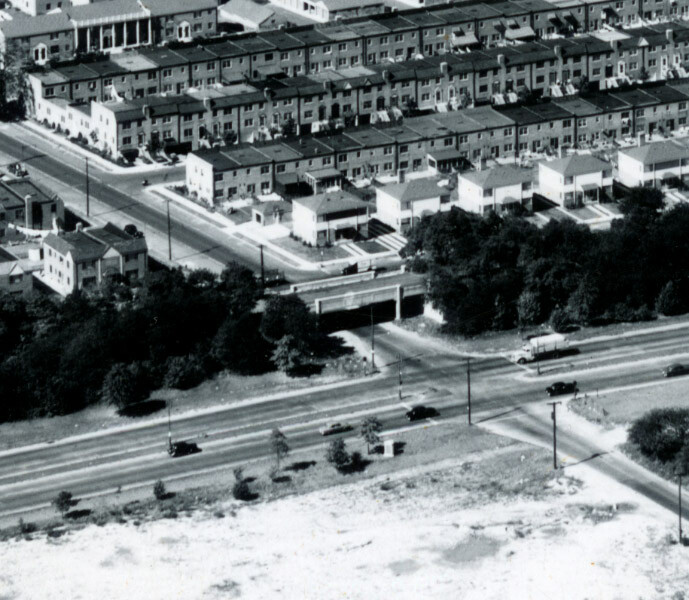 Kudos to David Stephan, unofficial historian for a Fresh Meadows civic group, for his below outstanding analysis of the Mystery Foto and his childhood memory of the North Hempstead Turnpike Motor Parkway Bridge. Updated January 16, 2018: David Stephan has added new captions to the images. 1950s image courtesy of Robert C. Levine. Two images courtesy of Mitch Kaftan captured by his father Douglas Kaften in 1955. The aerial was photographed by Thomas Airviews. 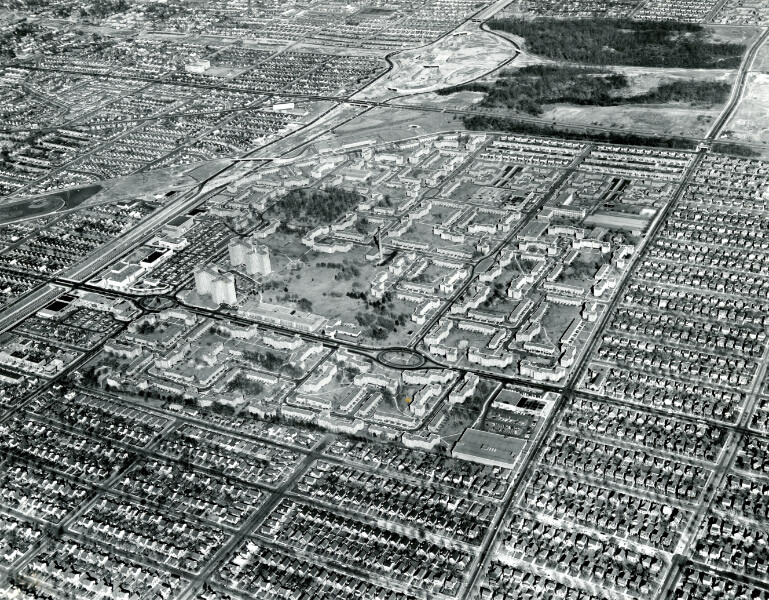 In this aerial, the Fresh Meadows complex was outlined. Francis Lewis Boulevard can be seen just north of the Motor Parkway. David Stephan: As a side note, while this “missing link” stretch of Francis Lewis Boulevard from Horace Harding Boulevard to Union Turnpike was built in 1941, it was officially barricaded until 1946 due to the lack of the 60 street lights that the NYPD mandated for this stretch—and which could not be obtained due to wartime restrictions. However, according to an account at that time, many drivers drove around the barricade and rode on the unofficial road. Apparently, barricades do not seem to stop people in Fresh Meadows, whether they were put on a new road for drivers or put on an old Motor Parkway bridge for children’s safety! A great view of the North Hempstead Turnpike Motor Parkway Bridge and the Western Terminus. The Long Island Expressway had not yet begun to be constructed. View looking west to the Manhattan skyline. 73rd Avenue Motor Parkway Bridge. North Hempstead Turnpike Motor Parkway Bridge. Looking west. 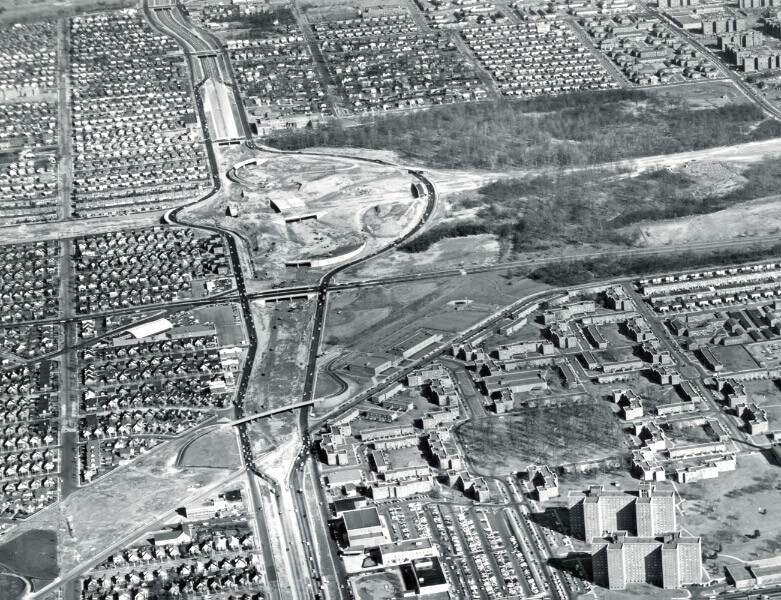 The Clearview Expressway can be seen under construction on the left. The close-up reveals the construction of the Clearview Expressway/Long Island Expressway interchange. The North Hempstead Turnpike Motor Parkway Bridge had been taken down in this aerial. David Stephan: This aerial also records the thoughtless disregard of the Motor Parkway continuity as a slope for an expressway bridge over Union Tpke was being created. 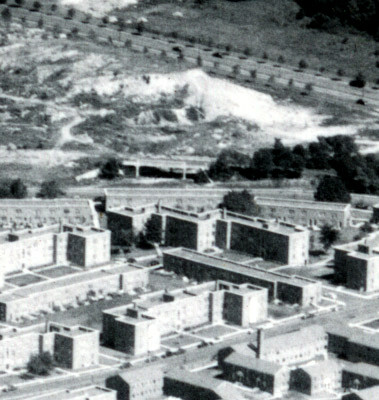 Even in your posted web image you can see the Motor Parkway roadbed just east of the Clearview slope sitting in full view and now permanently disconnected from the western terminus in spite of the special bridge over Francis Lewis Boulevard that Robert Moses had constructed less than twenty years earlier. Historic preservation was not very strong then! The North Hempstead Turnpike Motor Parkway Bridge had been taken down in the above aerial. Likely taken from the roof of one of the apartment buildings. David Stephan: A clsoe-up shows the Long Island Expressway under construction. I consider clear shots of LIE construction in Fresh Meadows rare. 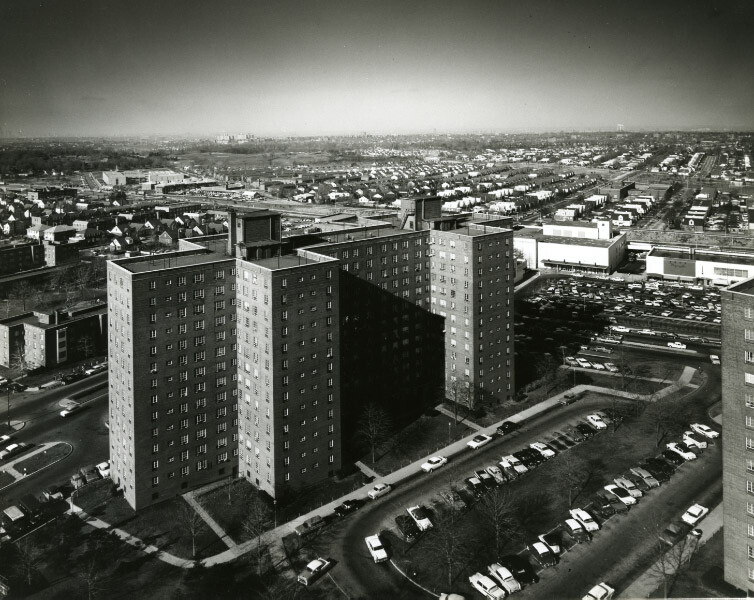 David Stephan: The image seems to be taken from the roof of the 20-story building (built in 1962) and includes Francis Lewis High School (built in 1960), perhaps a reason for this unusual, for photographic reasons, orientation that maximizes shadows cast across the Fresh Meadows buildings in the foreground. Motor Parkway Right-of-Way with the current Francis Lewis Boulevard Pedestrian Overpass highlighted in red. Over Fresh Meadows Looking SouthEast at the old Western terminus of the Motor Parkway. According to VCR website, the caption for this mentions ‘courtesy of New York Life Archives. Unsure of the reason for the aerial, need further research. The view is in Fresh Meadows. We see the LIMP western terminus, and the beginning of the ROW moving south towards 73rd Ave. We see the old Nassau Blvd bridge and the 73rd Ave bridge. We also see the bridge over Francis Lewis Blvd that was built by the parks department to connect the LMP/Greenway bicycle trail. Somewhere hidden in the trees is the Hollis Ave Bridge. My date for this picture is the late 1950’s, due to the development in Fresh Meadow, and the absence of the Clearview Expressway soon to dissect this picture. The source is the New York Life Archives, based on Howard’s Blog post of Jan. 7, 2009 titled “A Fresh Meadows view of the Western LIMP Terminus”. New York Life bought the property of the Fresh Meadows Country Club for just about $1 million in 1946 and developed a major suburban housing and retail complex. 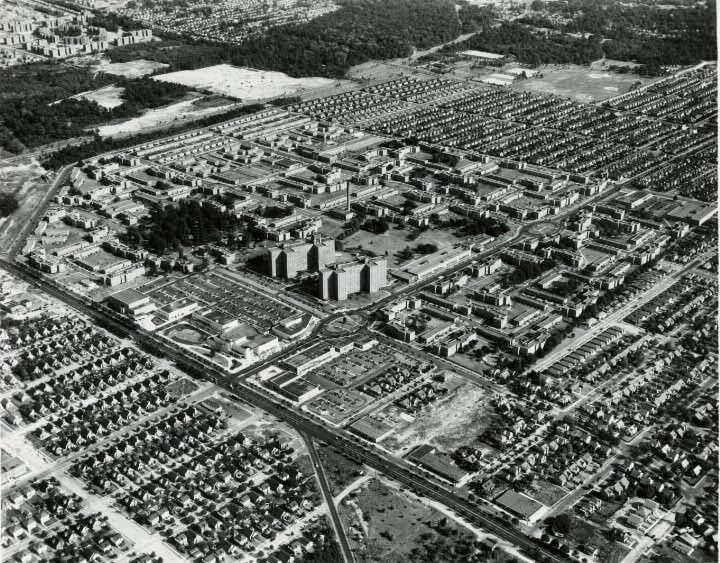 The photograph was taken by Bill Thomas Sr., of Thomas Airviews in 1948 and was probably used to promote the development which opened in 1949. In 1972, NY Life sold the property to Harry B. Helmsley for a price reported to be more than $50 million. I’m no accountant, but even with inflation and future cost of funds, I would assume NY Life did pretty well. Maybe some of our number crunchers out there can figure what their rate of return turns out to be for the 26 years they had owned the property. Helmsley later sold to a foundation in 1997 for $215 so he also probably did okay! And that group sold for a reported $250 - $300 not so long after that too! The photograph also appears in a research study issued by the Macauley Honor College of CUNY. In the foreground it looks like Horace Harding Expressway (today aka 495) which heads East/West in Fresh Meadows. The perspective is looking to the South East. 188th Street is the road running north & south with the two traffic circles. The northern most (nearest) traffic circle is the Edward G. Holmes, Jr. Oval located at 64th Ave. which heads East and West. This is where the group of two tall buildings is located on the south east side of the oval. The further traffic circle is at 69th Ave. 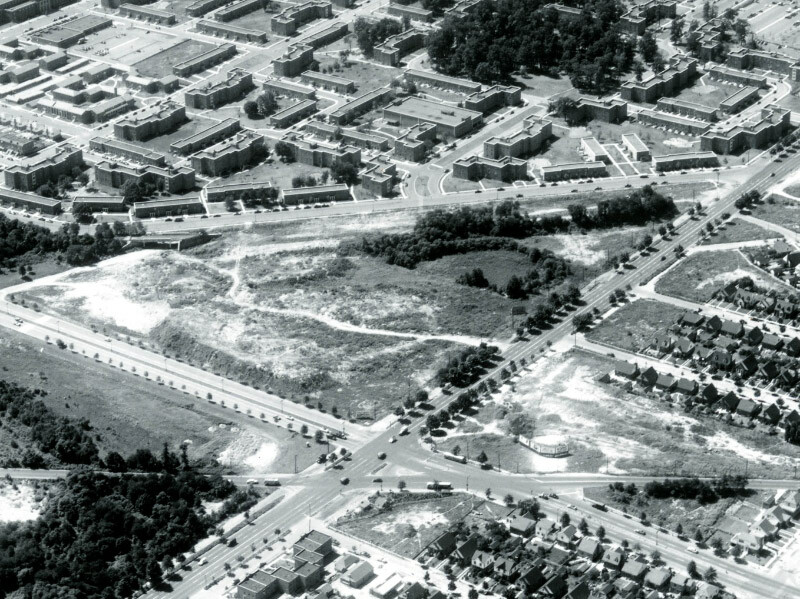 The area with the trees in the background is Cunningham Park (today the Clearview Expressway or 295 cuts through the middle going North/South) which is bordered by Francis Lewis Blvd. on the West Side running North/South. Union Turnpike which runs East/West is near what appears to be a ball field or open area in Cunningham Park on its Western End. See this link for what the Oval at 64th Ave and 188th street looks like today. 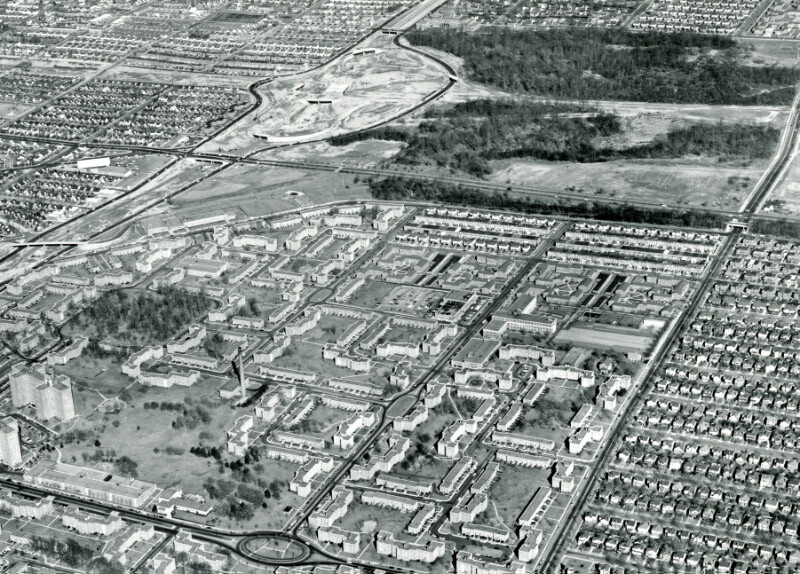 Fresh Meadows looking southeast.1964, worlds fair coverage first bridge off of Harding Blvd showcased many times, second bridge still standing as part of queens greenway. 2. Bridge over the remnant portion of North Hempstead Turnpike. Bridge over Francis Lewis Blvd. It was built when Francis Lewis was extended from Horace Harding Blvd. to Hillside Ave. during the War, although the extension did not open for traffic until 1946 when lampposts were added. 3. Appx. 1950, give or take a year. Bloomingdale’s, which is shown, opened in 1949. 4. Source: Hard to say. NY Life built Fresh Meadows. 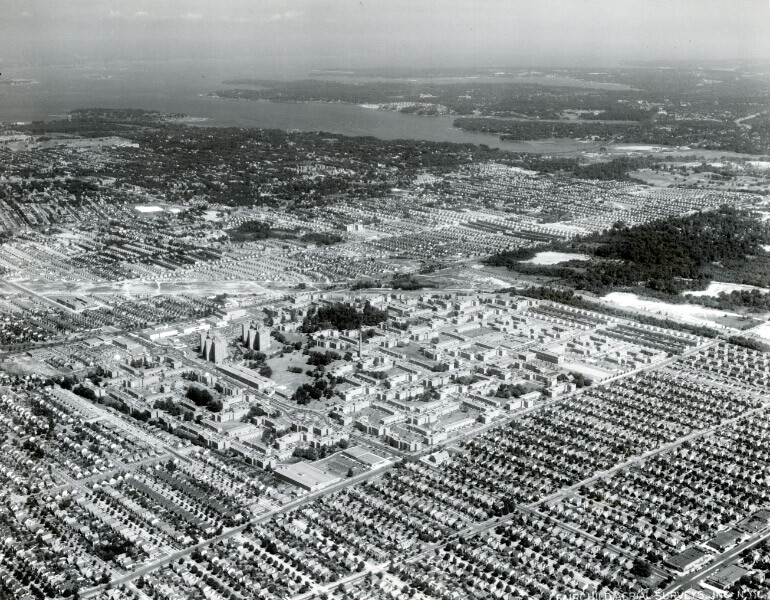 Fairchild Aviation took numerous photos of landmark areas on the Island and Queens. PS. 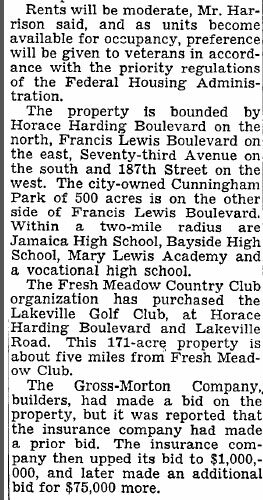 I grew up on 199th St. and 51st Ave, which was on the other side of Horace Harding Blvd. Photo is of Fresh Meadows. We are looking from northwest in lower right hand corner to the southeast in upper left hand corner. 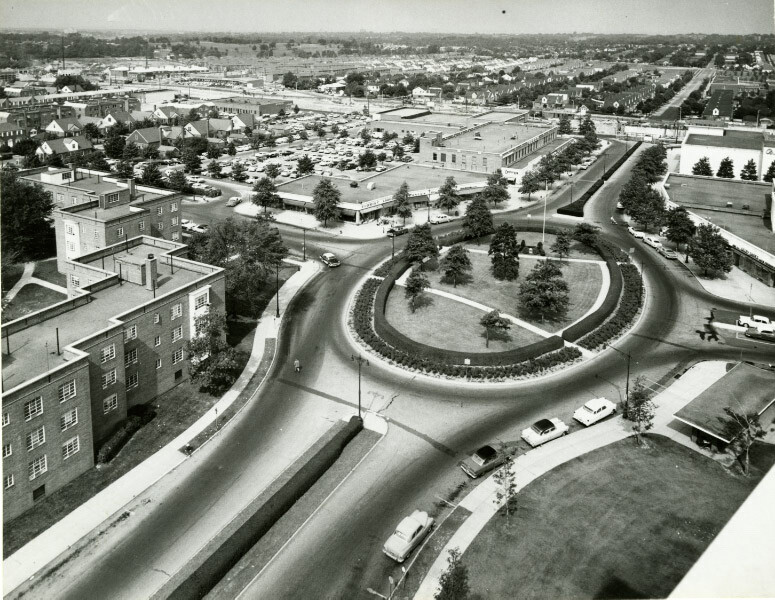 Roadway in the foreground is Horace Harding Blvd., in pre-LIE days. Street crossing over Horace Harding with the 2 ovals is 188th Street. Motor Parkway bridge towards the top is over 73rd Avenue (which I grew up on) and the lower one is over a road we didn’t know the name of when i lived there. It was i believe torn down when they built Bishop Reilly High School at the corner of LIE/Horace Harding and Francis Lewis Blvd. in early 1960s. 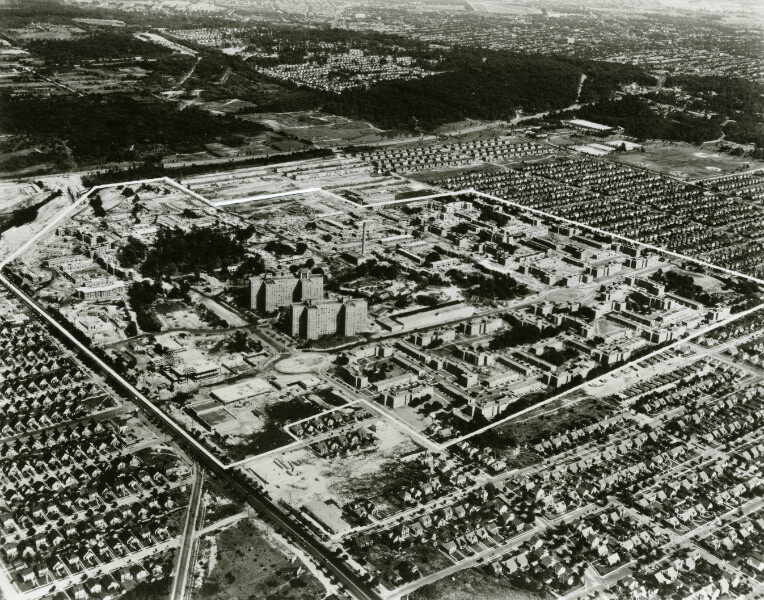 Date of photo is after Fresh Meadows development was completed in original phase and before LIE construction came through the area, which i recall as being around 1957 or ‘58. 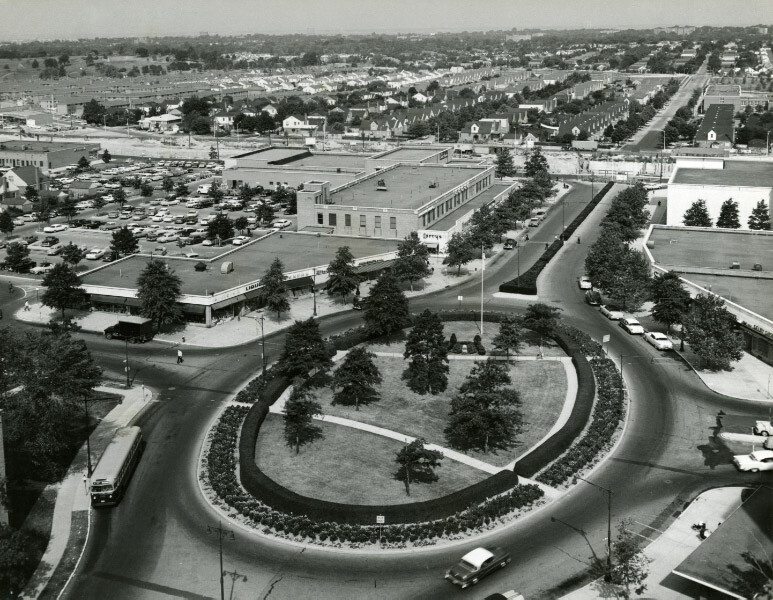 Long before the 21 story building was added to Fresh Meadows in early 1960’s. Therefore i would date the photo as being between 1952 and 1956. Purpose of photo? 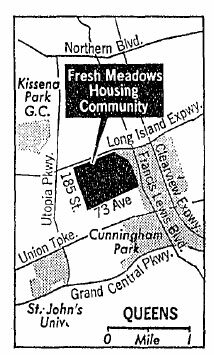 Could have been for New York Life, which built and owned Fresh Meadows until it was sold to Helmsley-Spear in the late ‘60’s. Or for planning for the LIE? Clearview? Location/Orientation: Fresh Meadows, Queens. Viewing southeast. LIMP bridges: N Hempstead Tpke & 73rd Ave Pkwy Type. The overpass crossing Francis Lewis Blvd. isn’t an original LIMP bridge. It was built by the city to connect the parklands for the public. This bridge doesn’t follow the original LIMP. The LIMP continues a little more south of the overpass, then continues a dead east. The Clearview Expwy isn’t built yet. But the expwy eventually severs the LIMP. Year: I’ll commit to 1950. Aerial Source/Reason: To display the New Housing Developments. Also can make out the remains of N Hempstead Tpke & small sections of the Central RR ROW, all E/O the LIMP. The photo is over Fresh Meadows and we are looking south-east. The bridges are North Hempstead Turnpike (remnant), 73rd. Avenue, and hidden in the trees are Hollis Court Blvd. and Rocky Hill Road. Since the Francis Lewis Blvd. greenway bridge is there also, I’m guessing around 1948 for the date. I found a similar photo in the NY Life Archives so maybe this one is from there also. This might have been taken as part of the planning for the L. I. Expressway. This is where the 44-mile adventure began. Long Island Motor Parkway’s entrance at its western terminus looking SE, the first highway built for cars. 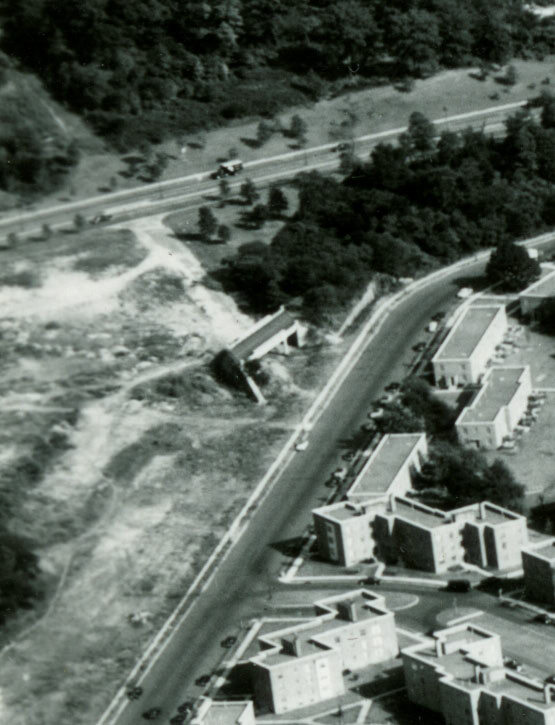 At Long Island Expressway and Peck Ave, the parkway actually ran just beyond Peck’s eastern sidewalk and is no longer visible in this aerial. P.S. 4 (eventually P.S. 179) would occupy this space in 1955 so this aerial was taken shortly before then. Just twenty years earlier this was all open space with Fresh Meadow Country Club golf course in place of all the residential housing. A rare shot of the North Hempstead Tpke bridge ruins is visible here and so is the 73rd Ave bridge (Black Stump Rd) that still exists today! Aerial photo likely taken for the advancement of housing in eastern Queens. This place grew quickly, similar to Levittown in the ‘40s. at top right, and Grand Central Pkwy running laft to right across top just above the LIMP right of way. Photo might be from the Fairchild collection. As an unofficial historian for a Fresh Meadows civic group, I felt I had to answer Friday’s questions. Please abridge or excerpt this response to suit the needs of your blog. The aerial is Fresh Meadows and the photographer is facing east-southeast. As a reference, 188th St that slices through the Fresh Meadows development and contains two traffic circles (ovals) approximately aligns with magnetic north. 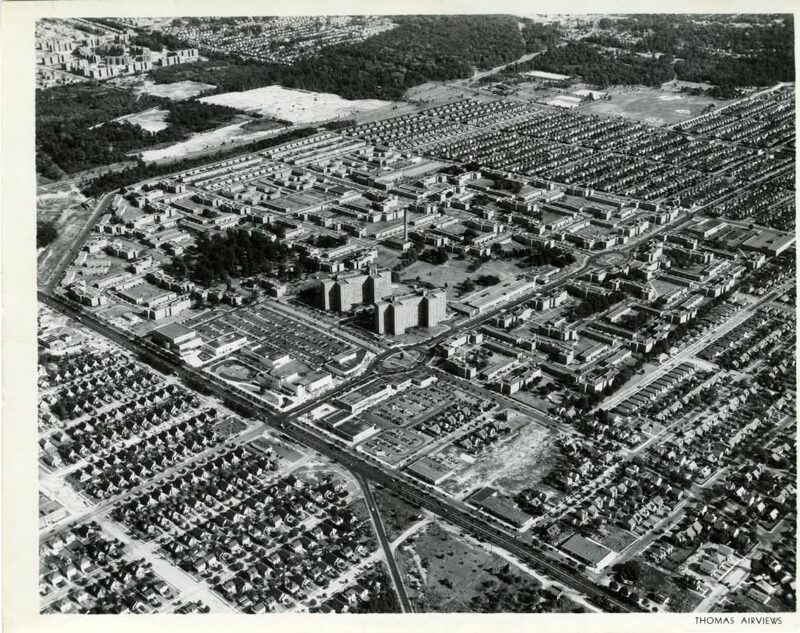 The foto is a Thomas Airviews aerial and would have been taken for the benefit of the developer, the New York Life Insurance Company, and, perhaps, the complex designer, Voorhees, Walker, Foley & Smith. 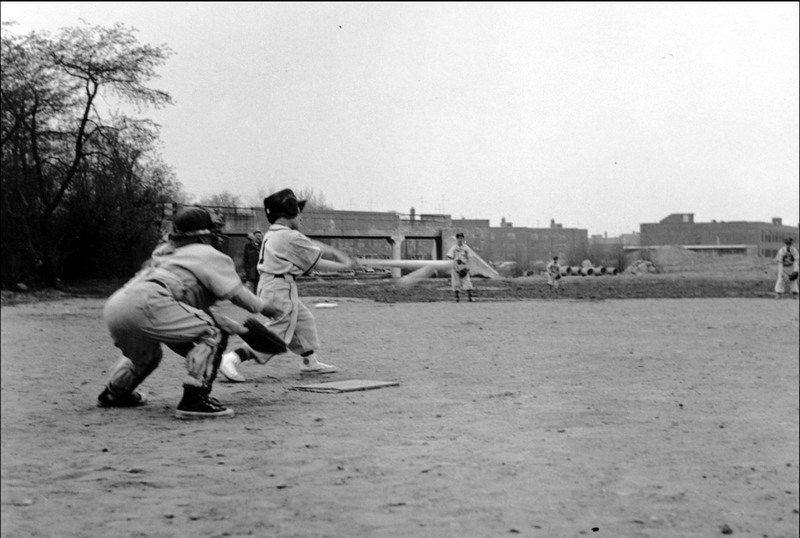 Similar pictures exist in the Fresh Meadows archive that NY Life created and which is now held by the current owner of the Fresh Meadows residential development. Both Motor Parkway bridge #1 (North Hempstead Tpke) & #2 (73rd Avenue) can be clearly seen. Also seen is the bridge over Francis Lewis Blvd. constructed in the early 1940s under the supervision of Robert Moses and considered a “honorary” Motor Parkway bridge by us locals. Evidence in the picture suggests this aerial was taken in 1951. 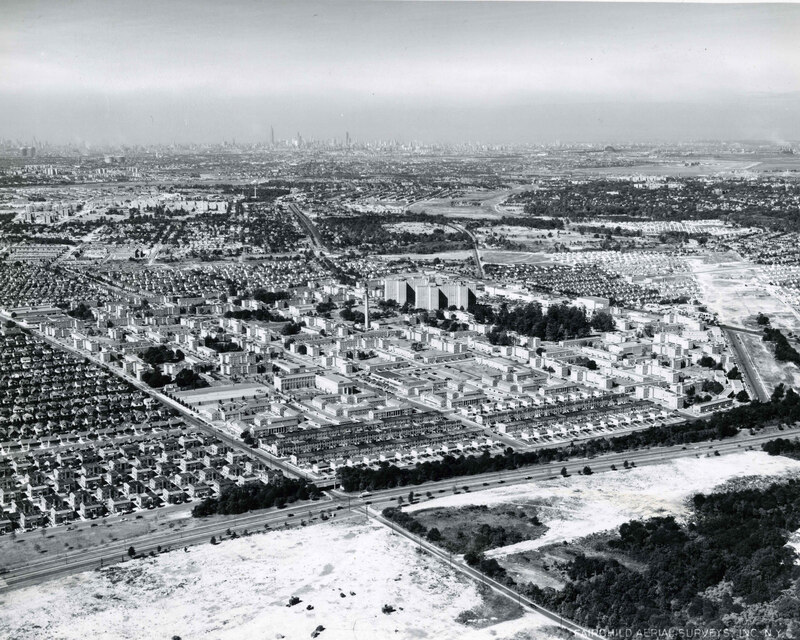 Homes have been built on a newly constructed segment of 185th St., just south of 64th Avenue, which means picture cannot be from before 1950. (The new 185th St. segment appears as a broad white stripe to the west of the development.) The neighboring Meadowlark Gardens apartment complex has been completed, which dates the picture to no earlier than 1951. New homes line the new 196th Place (thin white line the centers a wide spacing between homes south of 73rd Avenue), both of which were constructed during the 1950-51 period. Because PS 179Q on Peck Avenue was built in 1955, many would know that the aerial is from before 1955, but careful analysis of street trees and other small details establishes a much earlier “before” date. 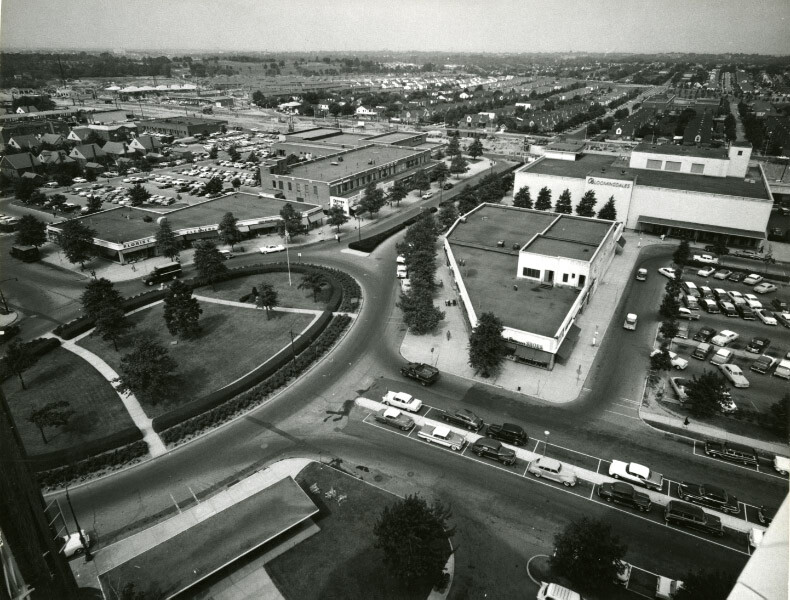 Searching the Digital Collections of the NYS Archives uncovers several aerials of “Fresh Meadows Housing” dated September 5, 1951, including a photo with the identifier NYSA_B1598-99_3653 that features the Fresh Meadows main shopping center along Horace Harding Blvd. The 188th St. northern oval remembers Pvt. Edgar G. (“Gilbert”) Holmes, Jr., said to be, in July, 1950, the first New Yorker killed in combat in the Korean War. 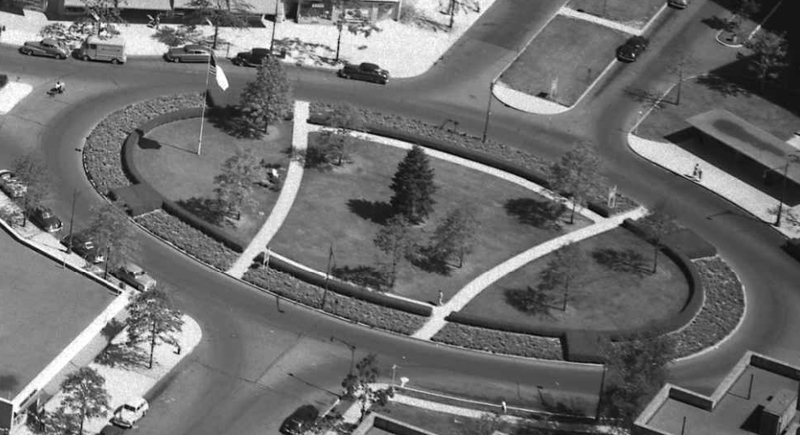 The attached closeup of a September 5, 1951 aerial includes the American flagpole and boulder-mounted plaque (irregular white object to the left of the left walkway) and a number of trees planted around the center evergreen. Mystery Foto #2 does not include all those details nor does it show the more mature tree close to the flagpole in the attached that some have stated is also part of the Holmes memorial. These observations establish that the photo was taken before September 1951. (Other comparisons between the mystery foto and related archive images can be made to support that conclusion.) Because the picture cannot have been taken before 1951, the aerial must have been taken sometime in 1951. And because trees are full of leaves, the aerial cannot be from the early winter months of 1951, suggesting a late spring or summer date. P.S. As for the demise of Motor Parkway bridge #1, my older sister and her peers discovered the thrill of riding down the eastern edge of the northern abutment. Nervous Fresh Meadows parents began to see the bridge as a safety hazard and this led to the bridge being fenced off in an attempt to prevent children from getting onto the bridge deck. When that failed to discourage us children (it was easy to sneak past the fencing), the adults lobbied to have the bridge taken down. Because I remember that one time I “finally” had the “courage” to copy my sister—and ended up immensely enjoyed my ride down that forbidden abutment—the bridge must have been taken down sometime after 1955, as I was not even riding a tricycle in 1955! 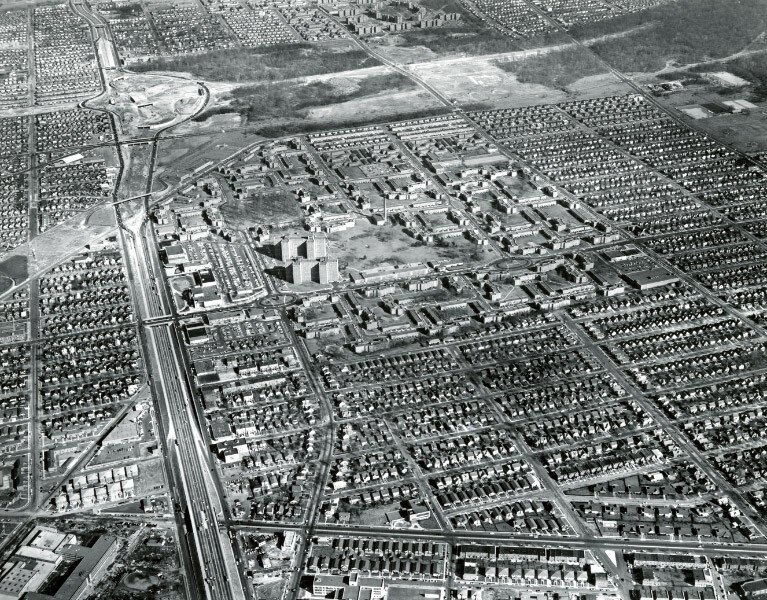 The aerial photo is facing towards the southeast over Fresh Meadows, Cunningham Park, and Hollis Harding Blvd ( Nassau Blvd Toll House/Lodge and the western terminus of the LIMP.). LIMP bridges that can be seen are, North Hempstead Turnpike, 73rd Ave, and the Francis Lewis Blvd bike path overpass bridge, Hollis Court Blvd and Bell Blvd bridges are in the photo but can not be seen. The photo is taken most likely by the New York Life Insurance Company for their Fresh Meadows Housing Development Project. The photo is from the New York Life archives. New York Life started the development in Feb 1946 after purchasing the old Fresh Meadows Golf Club. The project was built from 1946 until 1949. The LI expressway was started in 1954 along Horace Harding Blvd. The Clearview Expressway was started near the location in Sept of 1956. You do not see these projects started. A rough date of the photo would then be from 1948 until 1953. My best guess is that the photo was taken in 1948. 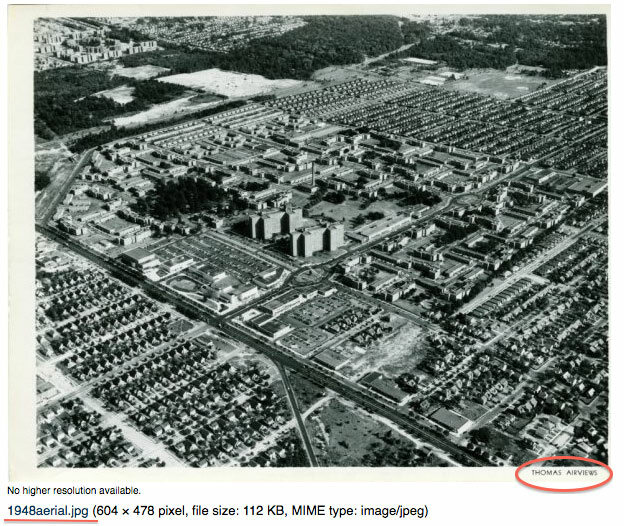 The photo was to document NY Life’s Fresh Meadows Housing Development. You can also observe the 2 acre Oak Grove Park in the photo. Great info here by all on the LIMP terminus and surrounding area. David’s observations help narrow the year when the N Hemp Tpke bridge was removed. 1955 now makes a lot more sense. Upon the school’s completion (1955), it must’ve been mandatory to have the bridge removed as well. I’d love to hear childhood resident Roy Warner’s input here. Even though Roy lived on the opposite side of the boulevard, kids wander off exploring new reaches in all directions, never forgetting their experiences along the way. I never forgot mine. 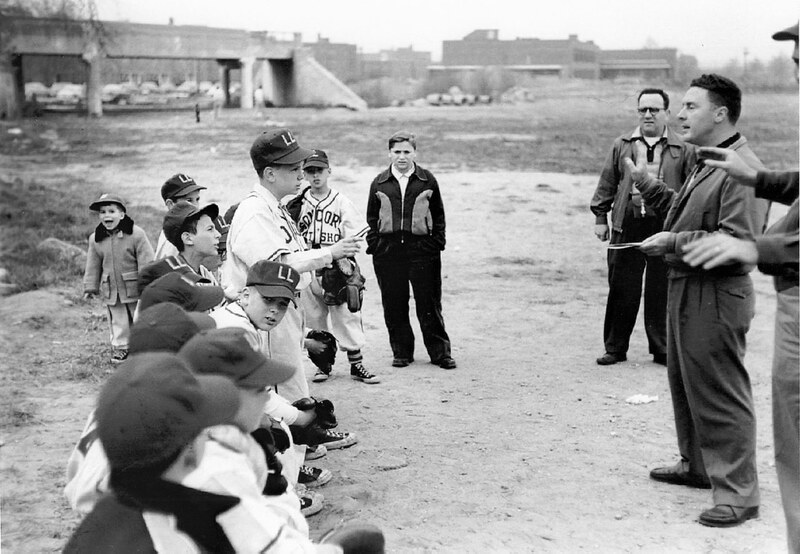 The famous Little League photo with the NHT overpass that Sam’s page displays (taken by my Dad) shows the construction of PS179 next door. That was about March 1955 or so. Does anyone (Howard?) have any further information about the “honorary” bridge over Francis Lewis Blvd? How long did it last? It was taken down and rebuilt after Francis Lewis Blvd was widened, but I don’t know exactly when that happened. Mitch, I do not have any information on the “honorary bridge”. Thanks anyway, Howard. How about Al Velocci? 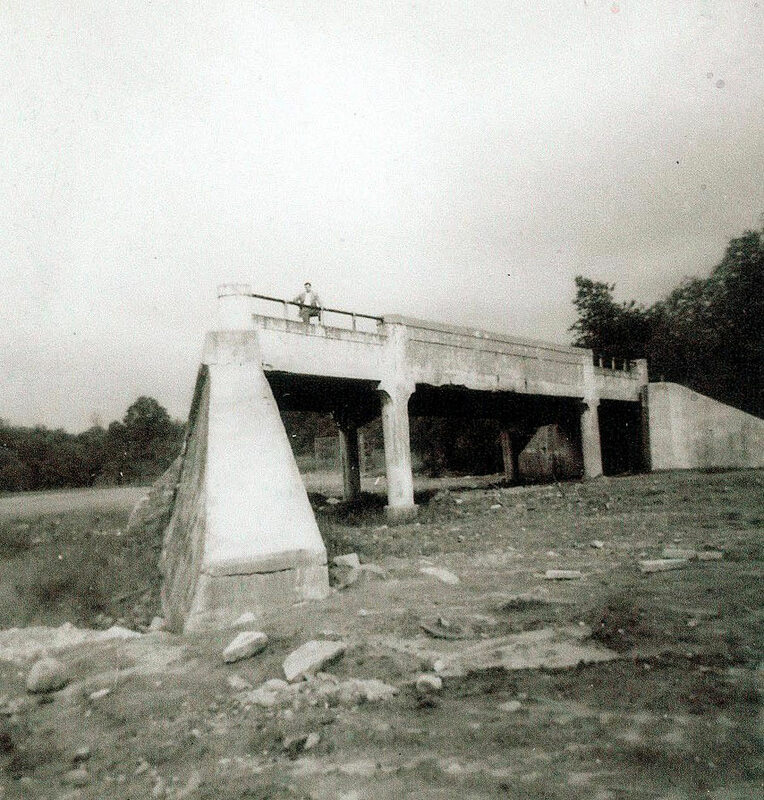 Thanks for sharing your photos of the N Hemp Tpke bridge that your Dad snapped back in 1955. Great that he was able to capture the bridge. I suspect the bridge was removed soon after the photo was taken, when P.S 179 was completed just down the block around the same time. The 2nd Francis Lewis ped overpass was put in sometime before 1951. 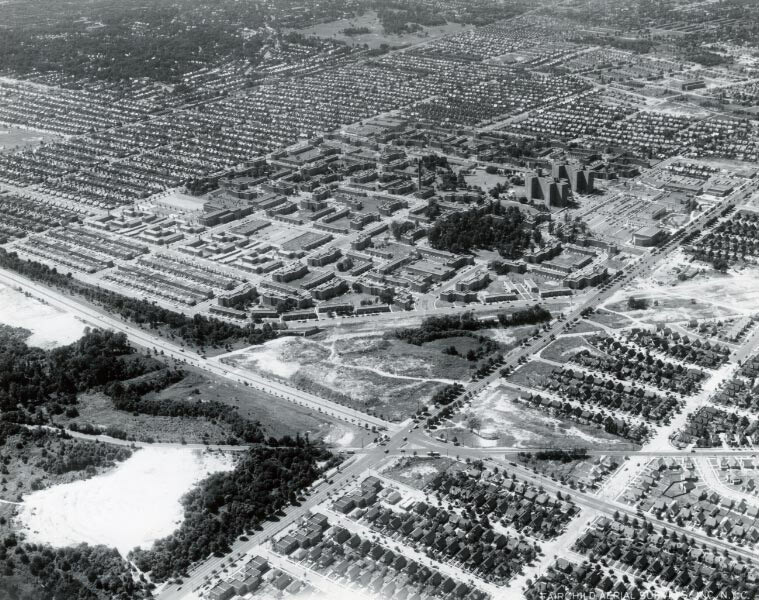 I’ve got a ‘51 aerial (sending to Howard) showing the boulevard’s expansion and overpass. The original overpass was put in 1942-1944. Check the link below and scroll to page 33, Job J6206. If this information is true, it took at least four years to put the bridge in after the parkway’s closing. Sorry for the confusion. The 1951 red path shows the present day pedestrian overpass but with a shorter walk path back to reconnect with the Motor Pkwy (green). The present day walk path (yellow) is longer in length, needing to slip under the newly built Clearview Expressway, and to reconnect back to the Motor Pkwy. This walk path diversion happened sometime in late 1960. Thanks Frank, you’re very thorough. Yes as per previous posts we sent with pics and videos the original LIMP is still very much there in the woods following Franks red line with many posts as well leading up to the clearview. Lots of posts out there. Check out my website of the area. I haven’t been back there in the woods in a while so planning my next tour there in the not too distant future (before the brush reappears)!